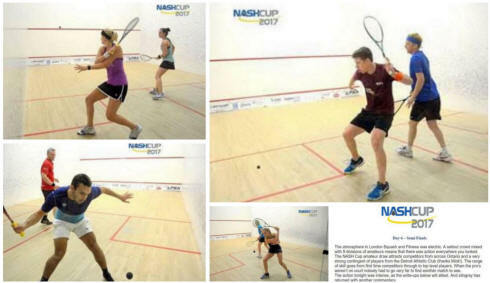 Top seeds Millie Tomlinson and Tom Richards made it an English double in London (Ontario) as they both came from game down to beat second seeds Fiona Moverley and Joel Makin in the finals. For Tomlinson it was a 12th PSA title, for Richards it was a first for five years. 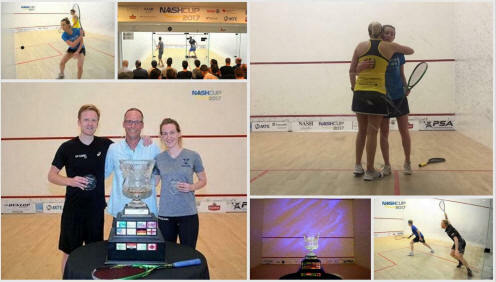 There will be two British Nash Cup champions in Ontario after semi-final wins from the top seeds Tom Richards, Joel Makin, Millie Tomlinson and Fiona Moverley. A quartet of Canadians kept home interest alive in the first round of the Nash Cup. On a night of marathon men's matches Nick Sachvie was the only home winner as he overcame sixth seed Charles Sharpes in an 81-minute tussle, setting up a quarter-final with Wales' Joel Makin, the second seed easing past Shawn Delierre in a mere 30 minutes. Youssef Soliman and Ben Coleman, who both needed over 80 minutes to see off their oopponents, meet in the bottom half, while top seed Tom Richards faces Pakistan's Farhan Zaman and Nathan Lake aims for an all-English semi-final as he takes on Belgian qualifier Jan Van Den Herrewegen, who beat fourth seeded American Todd Harrity in straight games. In the women's quarters home fans will be able to cheer on Sam Cornett, Danielle Letourneau and Nikki Todd. It might have been four, but Egyptian qualifier Nouran El Torky prevailed in five games over fifth seed Hollie Naughton to set up a meeting with top seed Millie Tomlinson. Todd, who beat fourth seeded Egyptian Nada Abbas in five, faces Misaki Kobayashi for a place in the semis. In the bottom half of the draw third seed Cornett eased past qualifier Anna Kimberley and now meets Amanda Landers-Murphy, who came from a game down to beat eighth seed Sarah Cardwell, while Letourneau meets second seeded Englishwoman Fiona Moverley. After two days of qualifying in London, Ontario, the main draws of the 2017 Nash Cup are complete, with Mike McCue the only added extra home interest. In the qualifying finals top seed McCue beat compatriot David Baillargeon in three close games and now faces top seed Tom Richards in the first round proper. 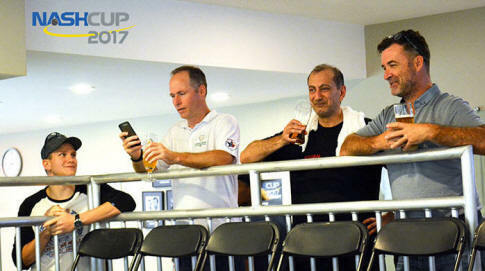 Pakistan's Shahjahan Khan, England's Ashley Davies, and second seeded Belgian Jan Van Den Herrewegen claimed the other qualifying spots. All six Canadian entries fell at the first qualifying hurdle, and it was the top seeds of Catalina Pelaez, Anna Kimberley, Nouran El Torky and Alison Thomson who came through the qualifying finals, Colombian Pelaez takes the distance by Diana Garcia with the others winning in straight games.